Celebrate love with an enjoyable set dinner at Waterfront Bar & Terrace. An array of delectable dishes has been prepared including Freshly Shucked Oysters, Lobster Bisque, a choice of mains between Tuna Wellington, Chicken Breast and U10 Sea Scallops, and a delicate sweet platter. 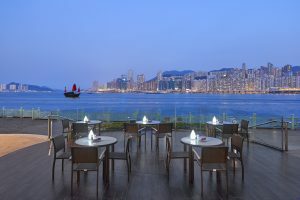 The set dinner is priced at HK$1,088 per couple including 2 glasses of welcome cocktail and a red rose for ladies.